Power tools for .NET Framework. 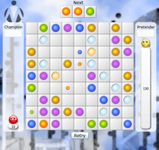 Games for desktop and mobile devices. Protection library performs all operations on validating license rules, like test license expiry or check Unlock Key validity. Protection library is available for .NET Framework 4.0, 4.5, .NET Windows 8.1 Store Applications and .NET Compact Framework 2.0 and 3.5. Data Service is the single access point to the database with licensing data. This is the WCF Data Service which provides data for License Manager and Activation Web Service. It can be hosted internally in the License Manager or in the IIS as web service. License Manager is the full functional application for complete license and customer management. It provides functionality on integrating protection to your product and allows synchronizing data with remote Data Service. Activation Web Service is the web service that allows online product activation and validation. This product can generate Activation Keys that binds software licenses to the particular PC. It also can communicate with e-Commerce services (like RegNow or ShareIt!) in order to create necessary software licensing information like Unlock Keys and/or license files. License Shop is the web-based (Silverlight) tools for complete customer and license management. Using it you can issue licenses and keys outside your office just using any Silverlight-ready PC. Floating License Web Service is the web service that allows centralized license distribution and concurrent using of licenses. It can be installed either into your client’s network or on your side. Database Manager is the application which install new or upgrade existing database, and allows copy licensing data from one database to another. Protected Storage Cleaner is the free application which can be installed to the PC and/or servers which are used to test protected application and which need not to have License Manager is installed in. It is used to clear protected storage from the old licensing data. Encryptor is the console application which performs encryption operations from the command line. It makes possible automation of the encryption during application building process (from the Visual Studio, for example). This application uses the same license as License Manager use (share it with License Manager). Using of this utility is allowed in the “Professional Edition” and high. Manco Shapefile Editor is a powerful and very convenient tool for creating and editing geospatial information including ESRI shape files, KML files and corresponding data. Convenient editing of shapes geometry. Almost like in any vector graphic editor. Edit corresponding data "on the fly". For editing single shape’s data you just need to select it. You can edit multiple shapes and multiple layers simultaneously. You can edit geometry of multiple shapes at one time. Multiple layers can be saved as a single project, with corresponding z-order of the layers. Layers can be exported to the popular geospatial data formats. ESRI shape files and KML are supported currently. Vectorization tool allows you to create a layer from any image (map or floor plan), edit and then save it using supported geospatial data format. Data editing is really simple. All you need to do is just to select a layer and edit data in the table. There is a specific convenient editing template for each data type in table. Predefined shape libraries. For your convenience the shapes which can be placed over the map are organized into the libraries. You can use existing libraries of the shapes or create your own for particular tasks. For example, you can create shape library for floor plan which will include typical elements like doors, windows, tables, chairs and so on. Deep integration with Telerik RadMap control. Projects created with Manco Shapefile Editor can be easily loaded into the RadMap control in your application. Printing of the layers and map. 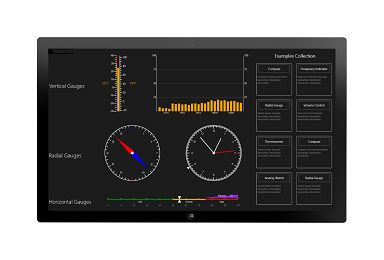 If you are building business dashboards, hardware control system or you just need graphical indicator then you will find our gauge controls very useful. With rich set of the radial and linear gauge types and the powerful customization capabilities you can build the exact dynamic data visualization tool that you need. 3 scale types: Horizontal, Vertical, and Radial. Radial scale allows creation of the wide range of the gauges including semicircle and quadrant-style gauges. 4 indicators: Marker, Needle, Bar, and State. Animation. All indicators are smoothly animated out of the box. Scale ranges. You can place several value ranges along the scale which handle appearance of the scale objects (tick marks, labels, and indicators) and raise range events (enter, leave, stay in) when necessary. Events. Indicator value changes generate the ValueChanged and range based events. Custom elements. You can place any framework element along the scale and position it over the particular scale value or at the specific location inside the scale. If you are building business dashboards, enable the end users to analyze complex data or you just need graphical representation of the data then you will find our chart controls very useful. To find out more details and buy Manco Data Visualization suite you should visit Manco Data Visualization suite product page . This is classic good-known puzzle game from 90s. 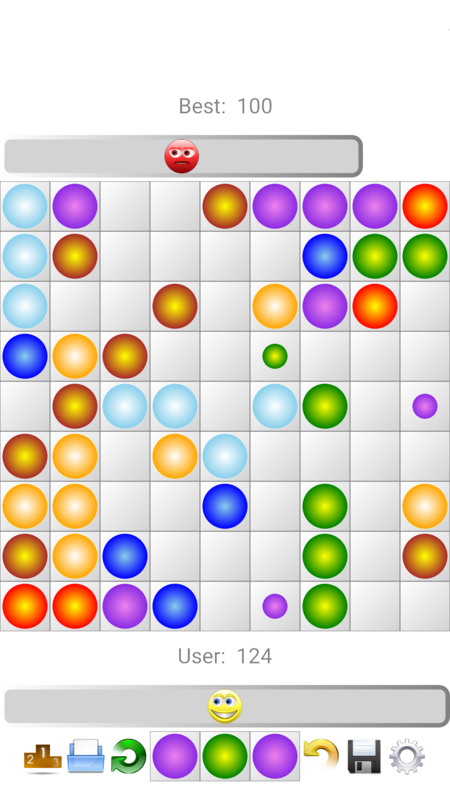 The target of the Color Lines game is getting the maximum score by placing the colored balls into the horizontal, vertical or diagonal line. When you put 5 or more balls in-line they disappear and you get the score points. The more balls you put in-line the more score you get. You can also play Silverlight version of this game from our site. This is classic good-known puzzle game from 90s. 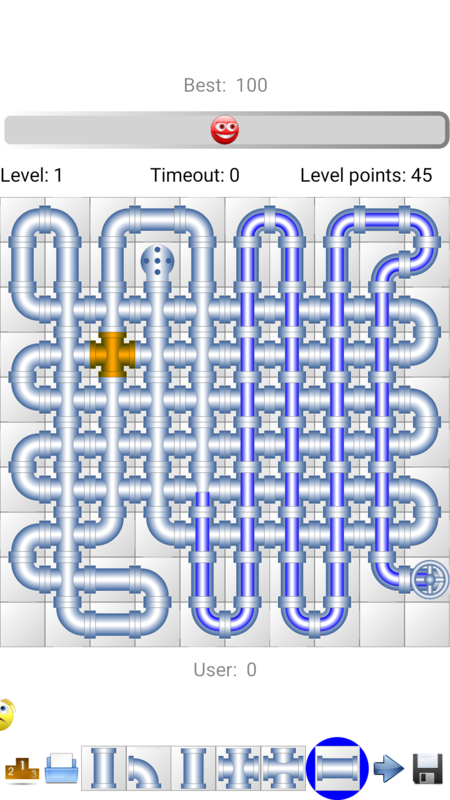 The target of the Plumber's Dream game is getting the maximum score by placing the pipes so the water could flow through from source to the destination. The more pipe segments you put between source and destination the more score you get. This is classic good-known puzzle game from 90s. 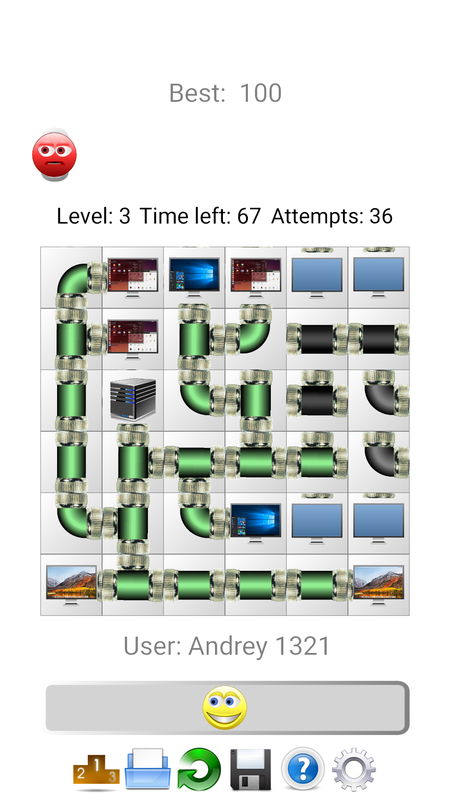 The target of the NetWalk game is to set order in a disconnected world and get all computers connected to the central data server. The less time you spent and less rotations you did the more score you get. The Manco.Chart for .NET is the solution to add feature rich charting abilities to Windows Forms and ASP.NET applications. Over 40 2D/3D charts are available. Flexible areas filling, scaling, legends, grid, context menus and drill-down. Uses OpenGL (3D) and GDI+ (2D) for fast-rendering charts. Package includes Manco.Chart for .NET itself, chart configuration controls, and arts to decorate chart area. For more details look at the Manco.Chart for .NET v 4.4 for .NET Framework 2.0. 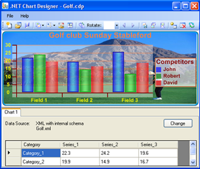 Smart Chart Designer is a comprehensive charting application that uses whole power of the Manco.Chart for .NET version 4.4. More then 40 chart types support multiple modes, meaning that literally hundreds of different styles and types are available for users. The legend can be flexible integrated to the chart area. The multi-line headers and the rotated labels are supported. The chart layout (titles, fonts, colors, labels’ escapement etc) can be stored in the file and reused with a different data, so you can easily manage style of your charts. Themes in the Smart Chart Designer are the real building blocks of the chart layout. By using themes you can create desirable view of the chart during a few seconds. The number of ready to use chart themes is provided with installation package. See the 'Art\Themes' subdirectory in the installation folder for theme files. You also can create your own themes and use it with your charts. Copyright © 2009 - 2018 Manco Software. New version (9.0) of the Manco .NET Licensing System has been released. New version (3.1) of the Manco Shapefile Editor has been released. New version (2.0) of the Manco Data Visualization suite has been released. New version (3.0) of the Manco Shapefile Editor has been released. New version (8.1) of the Manco .NET Licensing System has been released. New version (2.0) of the Manco Shapefile Editor has been released. New version (8.0) of the Manco .NET Licensing System has been released. New version (4.5) of the Manco .NET Obfuscator has been released. New version (4.0) of the Manco .NET Obfuscator has been released. New version (7.1) of the Manco .NET Licensing System has been released. New version (7.0) of the Manco .NET Licensing System has been released. 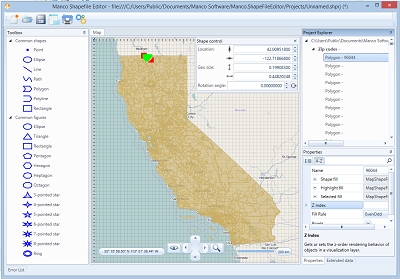 The Manco Shapefile Editor version 1.0 has been released. New version (6.2) of the Manco .NET Licensing System has been released. New version (3.1) of the Manco .NET Obfuscator has been released. 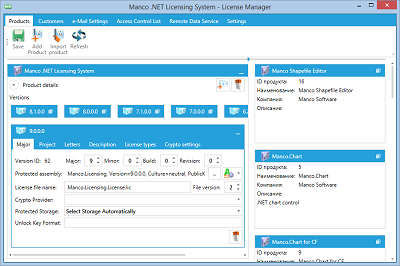 New version (6.1) of the Manco .NET Licensing System has been released. New version (6.0) of the Manco .NET Licensing System has been released. We released Manco .NET Obfuscator version 2.0. We released Manco .NET Obfuscator version 1.0. New version (5.0) of the Manco .NET Licensing System has been released. New version (4.1) of the Manco .NET Licensing System has been released. New version (5.0) of the Manco.Chart for Compact Framework has been released. New version (4.4) of the Manco.Chart for .NET .NET has been released. New web site has been launched.